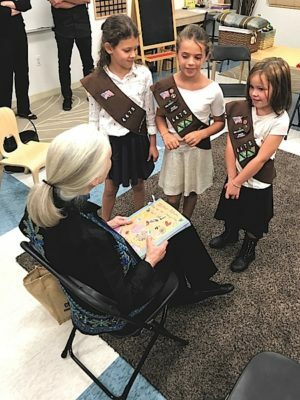 LEGEND Jane Goodall with Amelia Rodriguez and Alice Killoran, of West Hollywood, and, in center, Sienna Light, of Larchmont. 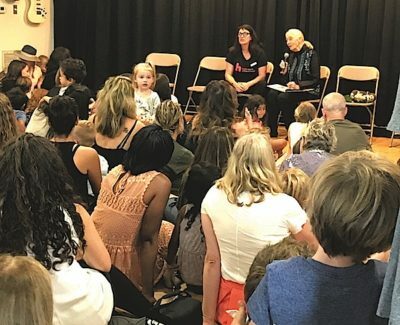 Tarzan married the wrong Jane, Dr. Jane Goodall smiled as she spoke to a 500+ crowd at Hollywood Schoolhouse last month. The world-renowned primatologist and conservationist read the book, “Tarzan of the Apes” when she was a child in England. While today, she finds the story too violent, back then, besides an apparent crush on the main character, the tale inspired her imagination and sparked her dream to go to Africa. Years later, when she fulfilled her goal, the continent did not disappoint. “The forest is a magical sort of place with waterfalls… and all the animals, buffaloes, leopards. It was a very beautiful world when I arrived,” she told the crowd on a sunny Sunday on a shaded patio at the Schoolhouse. Her meeting with Dr. Louis Leakey and her eventual research in the forest would spin the scientific community on its head — she discovered that our closest ancestors could make and use tools and had personalities and emotions. 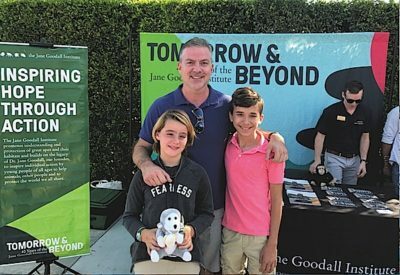 Jennifer Davison, a parent at the school who is co-producing a feature film about Goodall, invited her to share her Roots & Shoots program, which she founded with 12 students in Tanzania in 1991. It has grown to 100,000 active groups in 100 countries. 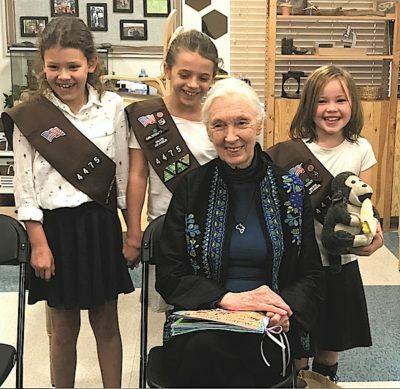 The 83-year-young Goodall travels 300 days a year to spread her message of hope in the face of climate change, deforestation and vanishing wildlife. JANE GOODALL at lecture at Hollywood Schoolhouse. In her talk to the standing-ovation, sold-out crowd, she transported the preschool to sixth-graders to an era before wifi and television, when she was comforted by stuffed animals, her dog Rusty and the “Doctor Doolittle” and Tarzan books. After high school, she saved enough money to take a boat, “they didn’t have planes back then like they do today,” to visit a friend’s farm in Kenya. 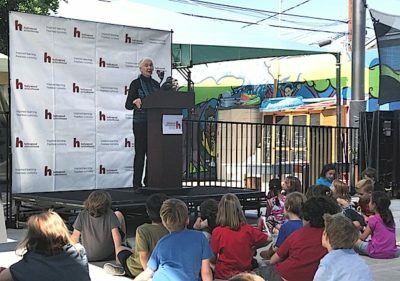 In her speech at the Schoolhouse, “Tomorrow and Beyond,” she described why she eventually left the world where she was happiest in her life to embark on her mission to protect nature, the animals and us. Logging, mining, the bush meat trade, poaching and population growth were having a devastating effect on the land and the wildlife. “Isn’t it strange the most intelligent creature ever is destroying the planet? Isn’t that stupid?” asked the primatologist-turned-activist. In Tanzania, she worked with local elders in villages, which led to changes for the better — for people and the environment. “If we don’t help these people, there’s no way we can help chimps,” she said. The strategy worked. Leafy trees returned, and corridors were built for chimps to move about. She continues the efforts to expand progress across the African plains and globally encourages people to do what they can in the areas that interest them. Sixth-grade students Iris Tricarico, for the school’s video Scoop and youtube channel, and Reva Dhanireddy, for the school’s newspaper, interviewed Goodall. “All over Africa, chimps are disappearing, forests are cut down. We have to work real hard to save what’s left,” Goodall told them. Goodall credited her “mum” as the most important person in her life, for encouraging her interests, even traveling to Africa with her at a time when women didn’t do such things. “There’s nothing more important than hope. Without hope we’re alone….